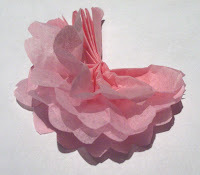 This is what I've been up to lately, making these delicate tissue flowers. The flowers will be glued onto contorted willow branches as part of a table centerpiece (providing all goes well). I'm really happy with the results, light, delicate & airy. Perfect for summer decorations. Layer four pieces of tissue paper together measuring at 2 1/4" by 3 1/2". 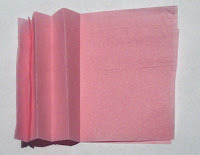 Fold together using an accordion fold (refer to picture). When you're finished with the accordion fold, it should look like the picture on the left. Pinch together and place on its side. It will now look like the picture on the right. Cut where yellow lines are shown, through all layers. 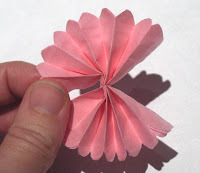 Your tissue flower should now look like the image on the left. With string, tie a loop around the center of the tissue where you made the slits. Now unfold tissue. Pull the first layer up. Begin to peel all four layers apart (picture on right). Now peel all the layers from the other side. Done. Hi:) How cute, thanks for the tutorial! I can think of a thousand fun things to do with those. Thanks for the tutorial! these look amazing! I bet I can find somewhere to put these, and they look easy...or is that deceiving ? are they tricky at all? Such beautiful paper flowers! It look wonderful as a center piece. They are beautiful! They remind me a cherry blossoms. Oh wow! These are so, so pretty! So many fun uses. I've gotta make a garland! Thanks so much for this, I'll be linking. These are really pretty! I love the way you did the edges. Adorable. These are so pretty! I've always wondered how they were made! Thanks for sharing!! Very lovely colour. The flowers are very sweet and cute. Love it. Thanks for the tutorial, I will have to try this they are so cute! Very cute and so well done! Thanks for the easy-to-follow tut! Very cute! I will save a link back to your site, I want to keep these i mind for a b-day=) Thanks! Happy summer weekend to you! So clever! Love how they turn out. Have a wonderful 4th my friend! I like these a lot. Thanks for posting the tutorial. lovely. Really Pretty. 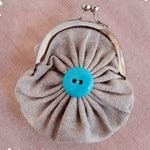 Have just put one on a gift wrapped in Pale pink Tissue. I made the flower in cerise to match the cushion inside. I used Indian silk hand made paper. Thank you. Thank you for the tutorial will definitely be trying these out. Very neat idea. 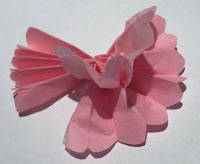 When I was young, (a million years ago) we used to make them out of Kleenex, but they weren't near as nice. I like the tissue paper idea and the slits in the middle would really help them fluff out nicely. Thanks for sharing. I made these tonight, only I used two colors of tissue paper (alternating) and tied them with one long strand of green yarn, effectively creating a flower garland. My girls loved it! Maybe you'll want to create a garland to go with your centerpiece? One tip, it helps to tie them on before you flare them out. These are so pretty... I'd love it if you would post it on my 'Friday's Nature Table' post today. Love the idea! Anything small is fun...I wonder how it would work if you kept the width the same, but didn't cut down the length...fold as you say, and then when you have all the accordion folds done, cut into the smaller parts, thus making folds for 2-3 (or more? )at a time. Would this work or would it be too cumbersome? 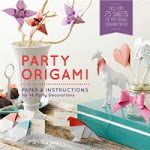 I just blogged about making up a centerpeice with these! Awsome..... i would like the same with fabric!!!!!! to put in may clothes!!! just lovely! 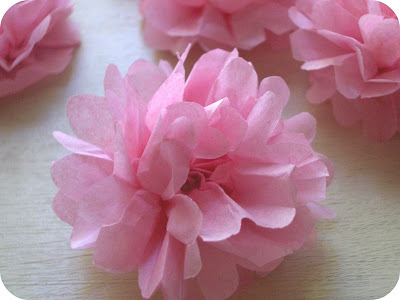 I love WebMommy's idea to alternate colors of tissue and to make a garland. So much easier than I ever would have thought. Darling! Simply beautiful! I can't wait to make them. Many thanks! Simply gorgeous! 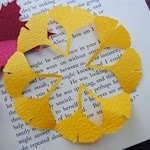 I've made some tissue flowers using die cuts, but I sure wanna try this tutorial! Thank you and your flowers are so lovely!! These were made from Kleenex in all colours for our cars in our wedding. (35+years ago) I believe I had help making 200 of these. These Tiny Delicate Tissue Flowers" are so easy to make and These flower's will provide us with the results, light, delicate and airy. Perfect for summer decorations. I am waiting for summer. Thank you for the tutorial. I and my bridesmaid made hundreds of these and then I used a straight pin with some glue on it and poked it into styrofoam balls. It took a while but the end result was awesome! They looked wonderful hanging over the dance floor at my wedding. I just bought purple for my silver anniversary party in the fall. And we just made them for my Mom's silver anniversary party using silver and white. Thanks for the tip on slitting the middle! That will really help. I had all the tips but that one! Thanks so much for the tutorial, those are absolutely lovely! 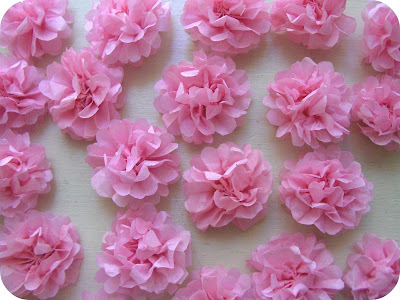 I´ve started making a whole bunch for my wedding and I wonder if anyone has ideas as to how to store them till the big day, and more importantly, how to transport them without crushing everything into one big mess? :)Thanks in advance! just tried one of these, it turned out cute! Thanks for the good directions and pics to go with them, that really helped! Cute! I like this tissue flowers. Thanks for guiding me through this. I will try to make something like that this weekend. Thank you very much! I was wondering how to do them, and you explained it very well. Thanks. I saw them tonight and just had to try right away. i had a time gettig to pull the tissue apart but I got it. I'm planning my wedding on a tight budget and I can't wait to create these for center pieces :) Thank you!! These are super cute thanks for the easy tutorial!! OMG! thank you so much. I just taught my interior design class these flowers and now we are using them for our homecoming hallway decorations! they're perfect! I've just made a small box for gifting some home-made sweets. This is just what I wanted to decorate the top - and so simple to do.